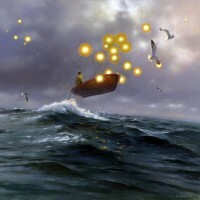 Born in Wexford, Jimmy Lawlor now lives and works in Mayo. Initially working in the field of Illustration, Jimmy opted to devote all of his time to a career in fine art painting in the late 1990s. 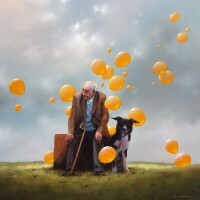 He has since exhibited extensively in his galleries in Ireland and internationally. Jimmy’s work derives its inspiration from his pastoral surroundings. He presents familiar scenes of rural Ireland: the people, towns, landscapes and animals, but with a humorous twist; often illustrating literal transcriptions of colloquial expressions. His work is based not only on the Irish sense of humour, but on the vivid realisation that the old way of life will have vanished by our next generation. 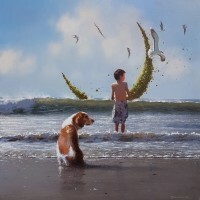 His work takes elements from his surroundings and mixes them with the people of the place, in their environment and doing what they love best. In their own way, they have helped create the atmosphere around them, whether they be farmers, business people, students or otherwise. Each town has its own characters and characteristics but they are basically the same in every town. He applauds these people and their character, which makes them unique. Lawlor appreciates the humour of the Irish people, he finds the gentle mannerisms that he encounters while painting them honourable. 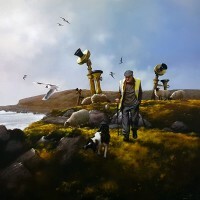 Lawlor’s work has been likened to the works of the surrealist’s – “imagine a Salvador Dali who has regained at least half of his sanity and moved to the west of Ireland, and you begin to enjoy art that is not only accessible, but as warm and fantastic as a good dream”, Hugh Leonard, Art Critic with the Irish Independent, wrote of his work. 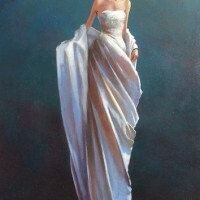 Lawlor’s work is included in many important private and corporate collections in Ireland and all around the world. Among them, Hugh Leonard, Treasury Holdings, Diageo Ireland, Dermot Desmond, Brenda Fricker, Great Southern Hotel Group, Government Buildings and Anglo Irish Bank, London.